﻿Time to get your thyme! 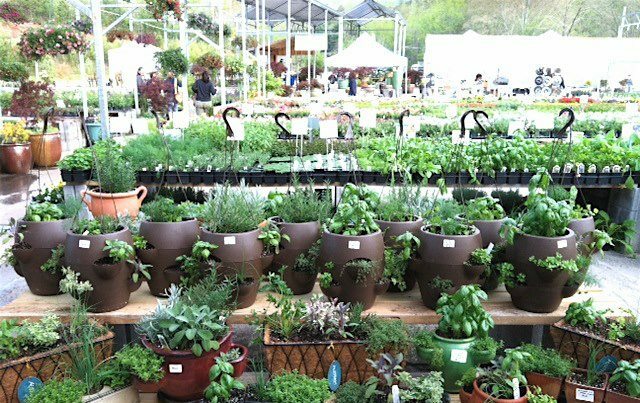 The 9th annual Painters Greenhouse Herb Festival is the weekend of April 13-14, 2013, at Painters Greenhouse in Old Fort, NC. Painters is one of our favorite places to buy plants and the herb festival features not only a variety of herbs on sale, but also local crafts, great food, live music and other activities. So while you’re walking among all the sage and rosemary, you can also check out the work of more than 25 local artisans and listen to fabulous music, featuring Lee Entrekin and Friends opening on Saturday followed by Mean Mary, then jazz and blues artist Linda Mitchell on Sunday morning followed by Jay Brown One-Man-Band performing American roots originals and classics. There is so much more to the herb festival (hello, famous Painters Pesto! ), so we highly recommend checking out Painters Greenhouse website at www.paintersgreenhouse.com for all the details. This entry was posted in Uncategorized and tagged festivals and special events, flora and fauna, Old Fort / Andrews Geyser, Spring by Inn on Mill Creek. Bookmark the permalink.